There are some herbs with a common reputation for use in hypertension – the use of hawthorn, valerian and garlic is well documented. 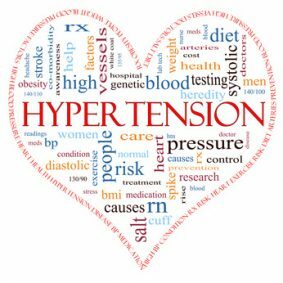 As a herbalist, I believe hypertension develops differently in each person; what contributes in one person will not be the same as another and so their prescription of herbs will be different too. Blood vessel health is important so I might use blueberry or yarrow; kidney function is often implicated so I may choose a diuretic – dandelion leaf, celery seed and/or limeflower. Often my consultation reveals the nervous system and adrenals need attention, using supportive herbs such as oats, borage, valerian, limeflower, and skullcap may contribute to lowering blood pressure here. If tension is an issue anti-spasmodics like cramp bark is often added for its effects on smooth muscle. As we age our bodies become less able to cope with stresses and strains and hypertension can be one manifestation of this, including a heart supporting herb like hawthorn or rose is almost always indicated in these cases – traditionally, these herbs were referred to as cordials and were common place a couple of generations back! Attention to diet can also help the body cope with age related hypertension. Keep caffeine and alcohol to an abosolute minimum, same with salt (or try pink Himalayan salt instead), avoid processed foods, eat plenty of wholegrains and be careful with full fat dairy products. Whatever method you use to control blood pressure, its vitally important to ensure you are regularly monitored by regular trips to your Medical Herbalist, GP, or practice nurse. Those with existing medical conditions or taking pharmaceuticals should always take advice from a Medical Herbalist before taking any herbal medicines. Do contact me for no obligation advice!